GRI-GLYCalc and Aspentech’s HYSYS are simulation tools frequently used to predict benzene emissions from glycol dehydration units. GLYCalc has been the software of choice for regulatory agencies in North America with respect to estimating benzene emissions from glycol dehydration units. The vast majority of dehydration units use Triethylene Glycol (TEG) to remove water from natural gas; the ability of these software tools to accurately predict benzene emissions in TEG dehydration units is therefore of primary importance for both operators and regulatory agencies. In addition, accurate prediction of dry gas water content is essential for the optimization of dehydration units and for the generation of Dehydrator Engineering and Operations Sheet graphs. GLYCalc has been successfully used in industry to calculate benzene emissions in TEG units, but there are limitations. As for HYSYS, the Peng Robinson package has historically been the standard for dehydration unit calculations; recently Aspentech introduced a Glycol package which notably has interaction parameters fitted for TEG-BTEX systems. GPA Research Report 131 (The Solubility of Selected Aromatic Hydrocarbons in Triethylene Glycol) is a key source of equilibrium data for TEG-water-BTEX systems at typical contactor, flash tank and still conditions. HYSYS predicted dry gas water content more accurately than GLYCalc. It is not uncommon for GLYCalc and HYSYS to give vastly different predictions; we conclude that GLYCalc frequently predicts dry gas water contents 50% lower than expected values. HYSYS-Glycol gave the best predictions here. 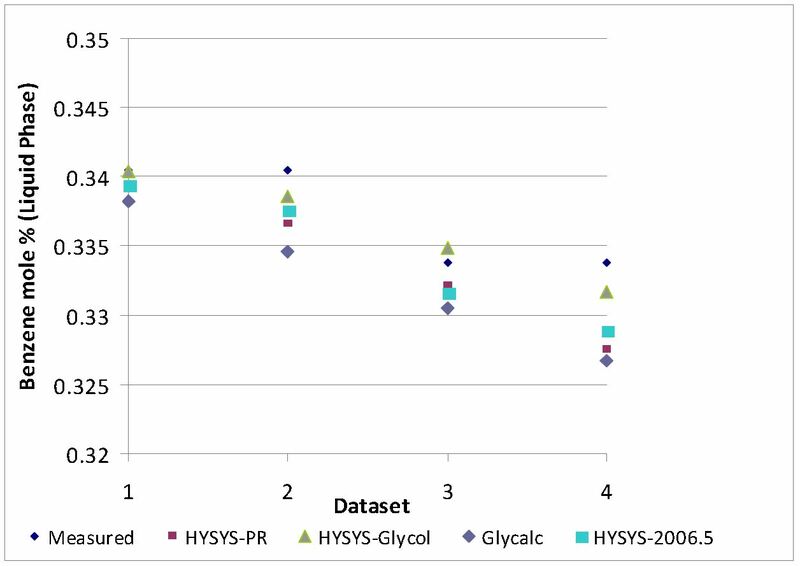 The following figure illustrates the comparison between the RR-131 data, GLYCalc, HYSYS-PR and HYSYS-Glycol at contactor conditions. All methods gave a reasonable match. Overall, GLYCalc gives reasonable predictions of benzene emissions in TEG units despite some of the shortcut methods used in the calculations. However, it does underpredict dry gas water content so care should be taken when calculating glycol circulation rate requirements. As for HYSYS, the Glycol package in HYSYS 2006.5 gives excellent results. Care should be taken when using different property packages or older versions of HYSYS. If you would like the full report, then please click here.